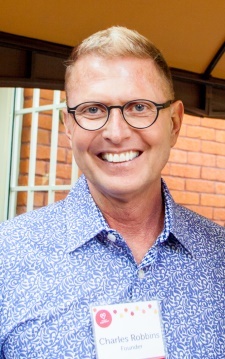 In 1991, Robbins moved to Denver from Los Angeles and started looking for opportunities to volunteer for organizations helping people with HIV/AIDS. Inspired by his belief in the importance of delivering compassion and nutrition to people with HIV/AIDS, Robbins spoke with Father Al Halverstadt, the rector at St. Barnabas Episcopal Church at the time, about his desire to recreate the experience he had in Los Angeles. Father Al brought Robbins into the kitchen at St. Barnabas, and asked, “Will this work?” In what Robbins calls a jaw-dropping moment, Project Angel Heart was born. After a few months of weekend deliveries, volunteer fundraising, and donated kitchen repairs, Project Angel Heart began preparing the meals they delivered. Recognizing the importance of providing a highly nutritious meal that clients could actually eat, and to differentiate Project Angel Heart from other meal providers at the time, Robbins took special care to modify meals. “The whole idea about delivering nutrition is that wasting syndrome was a very common issue for individuals that were living with AIDS and they couldn’t tolerate a lot of things. They became lactose intolerant or had acidic issues,” he said. The earliest menus focused on comfort food and seasonal specialties, like meatloaf and squash soup, and contained ingredients that clients experiencing intolerance and food sensitivities could eat. Robbins was eventually able to hire a small staff and served as executive director of Project Angel Heart until 1995, when he moved back to Los Angeles. He continued his work in HIV/AIDS service and is currently the chief advancement officer at AIDS Project Los Angeles (APLA Health). Project Angel Heart has grown and become a nutritional safety net for thousands of critically ill Coloradans. In 2016, the organization will serve 325,000 medically tailored meals, free of charge, to more than 2,800 Coloradans living with life-threatening illnesses like cancer, kidney/heart/lung disease, and HIV/AIDS. Today, Robbins looks back on his time at Project Angel Heart with gratitude and pride. He and his husband, Damon Romine, are constantly running into people in Los Angeles with connections to Project Angel Heart, and Robbins says he loves to hear their stories and talk about his role with the organization. This entry was posted in News and tagged 25 Years, 25th Birthday, Charles Robbins, Founder, History by Project Angel Heart. Bookmark the permalink.